Logan 108 price per day from € 112 Logan 108 is located in Chamonix-Mont-Blanc, just metres from the town and all of its facilities and services. It is equipped with a modern kitchen with a fridge/freezer, four-ring hob, a mini oven and a dishwasher. Hôtel Mont-Blanc Chamonix price per day from € 552 . Les Écrins De Soulane price per day from € 245 . Les Balcons du Savoy price per day from € 105 Les Balcons du Savoy is a residential hotel offering apartments with a balcony overlooking the Mont-Blanc mountain range. It offers an indoor swimming pool and free Wi-Fi access. 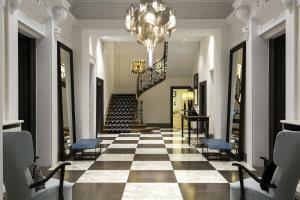 Les Balcons du Savoy has a games room, a bar and a lounge for guests entertainment. Apartment with pool, recommended by travellers ! Hotel Les Lanchers price per day from € 75 . Chambre d'Hôtes La Tanière de Groumff price per day from € 89 . La Savoyarde price per day from € 157 . 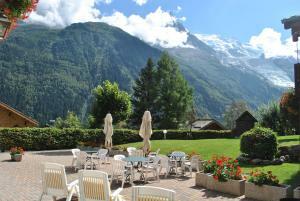 Hôtel Mont-Blanc Chamonix price per day from € 315 . L'Arveyron price per day from € 113 . 1. Head north on Rue de la République toward Pl. de la Bourse. 2. Turn right onto Rue du Bât d'Argent. 3. Turn left onto Quai Jean Moulin. 4. Continue onto Quai André Lassagne. 5. Slight right to stay on Quai André Lassagne. 6. Continue onto Cours d'Herbouville. 7. Keep right to stay on Cours d'Herbouville. 8. Continue onto Cours Aristide Briand. 9. Continue onto Quai Bellevue. 10. Continue onto Tunnel Bellevue. 11. Take the ramp to Marseille/Genève/Grenoble/Porta de Croix Luizet/Périphérique Est. Toll road. 12. Merge onto Bd Périphérique Nord. Toll road. 13. Continue onto Bd Périphérique Laurent Bonnevay. 14. Take the A42/Rocade Est exit toward Genève/Aéroport Saint Exupéry. 20. Take the D1506 exit on the left toward Chamonix-Mont-Blanc/Martigny. 21. At the roundabout, take the 3rd exit onto Route Blanche/D1506. 22. At the roundabout, take the 3rd exit onto Av. de Courmayeur. 23. At the roundabout, take the 1st exit onto Rue du Lyret. Go through 1 roundabout. 24. Turn left onto Quai d'Arve. 25. Turn left onto Av. Michel Croz. 26. Continue onto Rue de l'Hôtel de ville. Destination will be on the left. Vallee Blanche, Chamonix, 0.4 km from the centre of town of Chamonix. Mountain Aiguille de Midi, Chamonix, 0.5 km from the centre of town of Chamonix. Park Merlet, Les Houches, 5.2 km from the centre of town of Chamonix. Mountain Les Grands Montets, Chamonix, 7.4 km from the centre of town of Chamonix. Botanical garden Samoens, 20.7 km from the centre of town of Chamonix. Bikepark Les Gets, Les Gets, 30 km from the centre of town of Chamonix. Ski resort Aravis, recommended ski resort for experts. 36 km from town of Chamonix. Ski resort Abondance, number of cross country pistes: 35km. 41 km from town of Chamonix. Ski resort Albiez Montrond, number of cross country pistes: 15km. 89 km from town of Chamonix.